February | 2012 | FBorFW Strip Fix For Better or For Worse Comic Strip by Lynn Johnston. This entry was posted in Uncategorized on February 1, 2012 by stripfix. This entry was posted in Uncategorized on February 2, 2012 by stripfix. Lynn's Comments: When I'm working, I will make the same faces as the characters I'm drawing. It was funny for the kids to watch me--especially if the face I was drawing was screaming or just plain mad! This entry was posted in Uncategorized on February 3, 2012 by stripfix. This entry was posted in Uncategorized on February 4, 2012 by stripfix. Lynn's Comments: This is me. These are my words. This is also my mother and her logic. I could waste an entire day lying on the couch, wishing I was someone else, somewhere else, wondering why I had to wait so long to be out of the house and on my own. I wasn't even a teenager at the time--I was in elementary school. As a teen, I was involved in too many projects and clubs and activities to be bored. As a child, I was either off in a world of fantasy or trying to figure out why life was the way it was. I wanted to know why I was there, what I was going to do when I grew up, and I wanted to get started NOW! A day was so long and a week was forever. I figured I was wasting time. It wasn't until I was sent to the Vancouver School of Art for Saturday morning classes that I felt secure. For some kids, it's sports that get them out and energized. For me and for many of my friends, it was art that filled us with a sense of purpose. This entry was posted in Uncategorized on February 5, 2012 by stripfix. Lynn's Comments: As a young artist trying to get freelance work anywhere I could, I often found myself doing things for clients who offered to pay me, but when it came time to do so, had no money. It was hard to defend myself against such people, so I just kept producing and taking my lumps. I did a lot of illustration for a small local publisher when I was young. When I pleaded with him to pay me the money he owed me, he said I should be happy just to see my work in print! This entry was posted in Uncategorized on February 6, 2012 by stripfix. This entry was posted in Uncategorized on February 7, 2012 by stripfix. Lynn's Comments: Again, this was a fabricated scenario. There wasn't much my kids wouldn't eat. Anything that went well with ketchup would go down; quiche included! This entry was posted in Uncategorized on February 8, 2012 by stripfix. Lynn's Comments: This is a serious point and I wanted to make it -- people can avoid so much pain and expense if they just brush and floss their teeth regularly! This entry was posted in Uncategorized on February 9, 2012 by stripfix. Lynn's Comments: Kitchenware and home cosmetics demonstrations were actually a big deal in Lynn Lake. We all looked forward to the opportunity to get together and if we bought some overpriced items, well, we had supported the seller and the hostess and all was well in the world. The best home demo party I ever went to was here in Corbeil. It was my first opportunity to meet the local ladies, so I spruced up and took my chequebook. What I discovered was a relaxed and welcoming group, dressed in jeans and T's, drinking beer and gossiping about the neighbors. After several drinks, we were ready for the pitch and with all of us happily into the sauce, the demonstrator sold us everything! This entry was posted in Uncategorized on February 10, 2012 by stripfix. 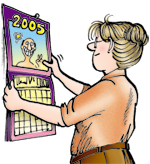 Lynn's Comments: When I did the weekly comic panel for the Dundas Valley Journal, they paid me $10 for each one. At the time, I was living on a shoestring and was desperate for a few dollars more. When I asked if they would increase my rate to $15, they refused. This is when I started doing cartoons for my obstetrician--preferring the approval from his patients and staff to the paper. I guess my pride was more important than my pocketbook. This entry was posted in Uncategorized on February 11, 2012 by stripfix. Lynn's Comments: This was an inside joke between Gunther Hildebrandt, a long time family friend, and ourselves. Gunther enjoyed reading the news and discussing current events, especially with my father-in-law. Together, they would solve the problems of the world. Gunther loved to talk, so in this strip I am having a bit of fun at his expense. The dental clinic was never the place to have a really good conversation, especially for the patient. Gunther was a good sport. 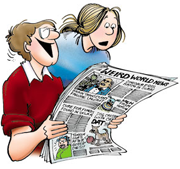 In fact, friends and family always enjoyed seeing their names, and it undoubtedly resulted in mail and phone calls from their own friends and family, from all across the continent, saying, "I saw you in the funny papers!" This entry was posted in Uncategorized on February 12, 2012 by stripfix. Lynn's Comments: This scenario is based on the time I lived alone with Aaron in Dundas. Our house was not close to the neighbouring houses and backed onto a steep ravine. The wind would often whistle across the awning over the front windows and the sound would creep me out! Even though you know you're safe and there's nothing to worry about, the childhood fears still come back. Sometimes, I really did think there were spooks in the rafters! This entry was posted in Uncategorized on February 13, 2012 by stripfix. Lynn's Comments: Every so often, I'd realize that I had not featured Farley in the strip for a while, so I'd find a way to write him in. Although I never slept with any of my pets, this is how I imagined sharing my space with a character like Farley. This entry was posted in Uncategorized on February 14, 2012 by stripfix. This entry was posted in Uncategorized on February 15, 2012 by stripfix. This entry was posted in Uncategorized on February 16, 2012 by stripfix. Lynn's Comments: The gift from the airport gift shop was a subject that brought a number of responses. Some letters came from travellers who bemoaned the fact that a small gift was expected. Others enjoyed shopping for treasure and the surprise it would bring. It was a really divisive subject and I learned that when it comes to gifts and the business traveller, it's much better to receive. Personally, I love to shop for "gifties" and sometimes the airport has the best shops! This entry was posted in Uncategorized on February 17, 2012 by stripfix. Lynn's Comments: This, I think is true. A couple needs to separate from time to time in order to reflect on their relationship. After a rough patch, you might wish your partner would just "take a hike" but when they are away for a few days, you realize just how much you depend on, rely on and love each other. This entry was posted in Uncategorized on February 18, 2012 by stripfix. Lynn's Comments: To end a dispute between Kate and Aaron, I did divide the kitchen table so that each child had their own side. I then divided the couch and Aaron himself divided the living room. This bit of biblical rectitude resulted in a deep interest in equality. Both kids then wanted to divide the house, the hallways, and the stairwell into "what's yours" and "what's mine". The task was not a small one, but they were determined. It gave them something to do together and the price of a roll of masking tape was a small price to pay for silence. I decided to use this in a Sunday strip. The thought that they might even have tried to divide the dog had me smiling for days! This entry was posted in Uncategorized on February 19, 2012 by stripfix. Lynn's Comments: My brother, Alan, moved from my home in Dundas to Hamilton and eventually to Stratford, Ontario--where he was principal trumpet for the Stratford Festival Theatre. In the strip, "Phil" only moved once and I never specified to where. This entry was posted in Uncategorized on February 20, 2012 by stripfix. This entry was posted in Uncategorized on February 21, 2012 by stripfix. Lynn's Comments: Making "Georgia" play flute delivered me from having to say how and where she and Phil met. This entry was posted in Uncategorized on February 22, 2012 by stripfix. This entry was posted in Uncategorized on February 23, 2012 by stripfix. Lynn's Comments: Alan's ordeal with the vegetarians did not end with the fridge and the juicer. He remembers giving them a list and some money for groceries.... and all they brought home was carrots! It wasn't long before he was making plans to move again. This entry was posted in Uncategorized on February 24, 2012 by stripfix. This entry was posted in Uncategorized on February 25, 2012 by stripfix. Lynn's Comments: When plastic glasses were introduced to our household in the 50's Alan and I used them for everything from sandbox scoops to stacking toys. It was fun to see how much water we could hold with the suction from our mouths before the glass would fall off. Hopefully we would catch it before it hit the floor and alerted the authorities. Having two kids in the strip allowed me to recall so many of my own childhood antics. This entry was posted in Uncategorized on February 26, 2012 by stripfix. Lynn's Comments: Alan did have a fish tank and Aaron wanted one as well. I allowed him to have a goldfish for a while...kind of a "Starter" pet. The fish lasted about a week before it died from over stimulation. I think it must have been glad to go. This entry was posted in Uncategorized on February 27, 2012 by stripfix. Lynn's Comments: Another unmistakable "Aaronism". This entry was posted in Uncategorized on February 28, 2012 by stripfix. This entry was posted in Uncategorized on February 29, 2012 by stripfix.